In a repeat of the previous night’s events when torch-carrying racists surrounded, trapped, and brutalized student protesters at the University of Virginia, police on Saturday stood back as “Unite The Right” attendees repeatedly left the boundaries of the park to attack counter-protesters. 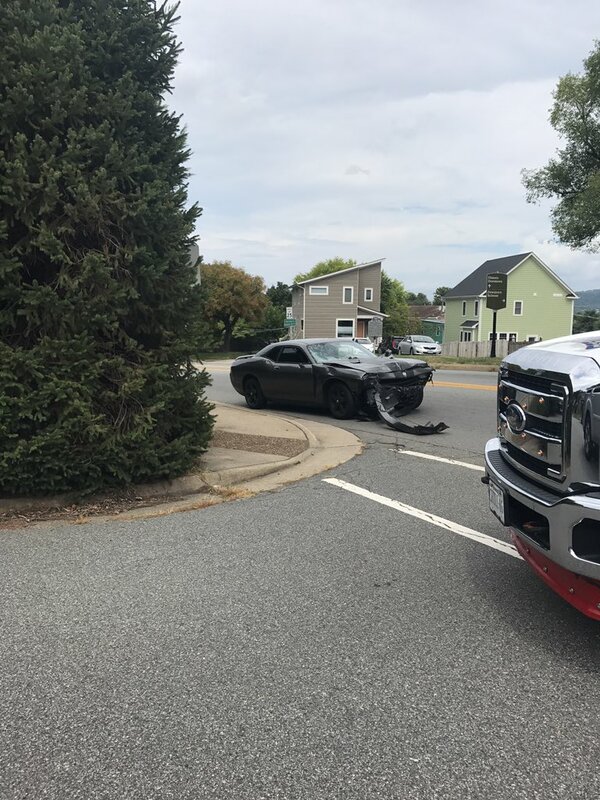 (At least one person was killed and 35 injured when a crowd of counter-protesters was rammed by a car, and the alleged driver James Alex Fields, Jr. was charged with second-degree murder – more below). The barricades surrounding “Unite The Right,” which had been taken down by neo-nazis to let them charge their opponents, were put back up by the same groups when police arrived. At around this time, anti-racist protesters advanced, took down the barricades, and moved to push the white supremacists out of the park at the same time riot police were preparing to confront both groups. Police then pushed the white supremacists out of Emancipation Park, and closed the park. Richard Spencer and his neo-nazi cohorts were seen repeatedly fighting with the police, yet none of them were arrested. After the fights ended, most of the hundreds of white supremacists had apparently dispersed, although some were still seen moving around downtown in small groups. Anti-racist protesters were still marching in the streets, generally unopposed, chanting anti-racist slogans. As a crowd of hundreds of counter-protesters was marching downtown, a vehicle turned a corner and accelerated and plowed into the crowd. It struck several other vehicles, and people were pinned between cars, as well as run over. The driver of the vehicle was reportedly pulled over and arrested. The vehicle, easily identified due to the damage it sustained, was later located after the driver was arrested. 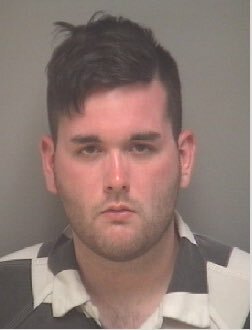 Saturday night, authorities identified the driver as 20-year-old James Alex Fields, Jr. of Ohio. His mother has stated that she knew he traveled to Virginia to attend the “Unite The Right” rally. He has been charged with second degree murder, three counts of malicious wounding, and failure to stop after an accident. Before the vehicle attack, Fields was seen wielding a shield with the insignia of “Vanguard America,” a far-right group which describes itself as “the Face of American Fascism” on Twitter. 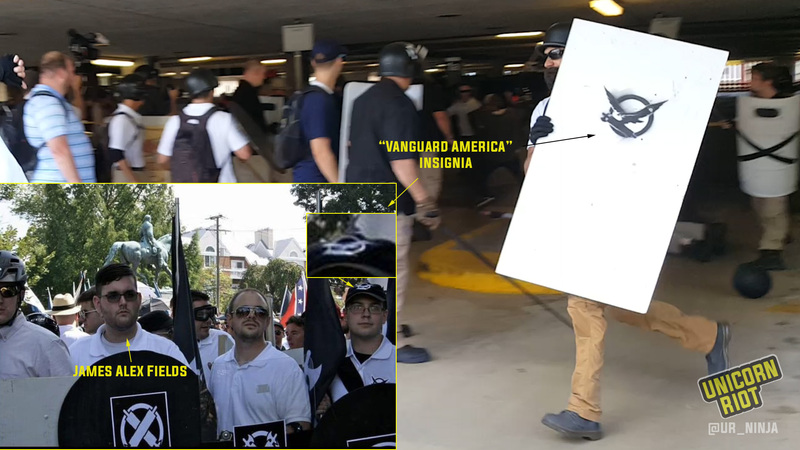 At least one shield with “Vanguard America” insignia was also used by white supremacists when attacking a group of people inside a parking garage, Unicorn Riot reporters documented. “Vanguard America” symbols were spotted in Charlottesville in a parking lot attack, as well as next to alleged murderer James Alex Fields, Jr.
Late Saturday night it was announced that one of the anti-racist protesters hit by Fields, 32-year old Heather D. Heyer, had died. 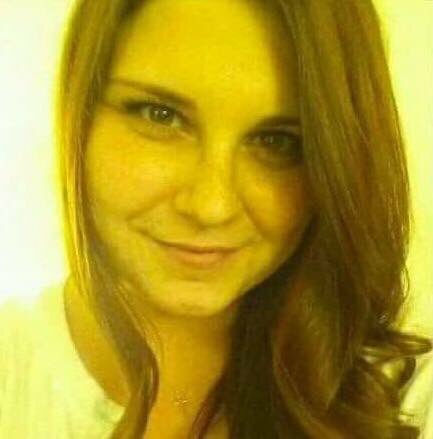 Heyer was a paralegal at a law firm in Charlottesville. Her friends and family say she was known for standing up to bullies as a child and as an adult used her legal knowledge to help people facing hard times with problems like reducing their medical debts. A law enforcement helicopter also crashed, killing Lt. H. Jay Cullen, and Trooper-Pilot Berke M.M. Bates. The Associated Press reported Virginia State Police announced Troy Dunigan, a 21-year-old from Chattanooga, Tennessee, was charged with disorderly conduct; Jacob L. Smith, a 21-year-old from Louisa, Virginia, was charged with assault and battery; and James M. O’Brien, 44, of Gainesville, Florida, was charged with carrying a concealed handgun.